Thank you so much, our tour around Boston was even better than expected, and the things I learned makes me want to come back and do even more around Boston. Our guide was on time, well organized, a great driver and very accommodating. He never ran out of interesting things to tell us and had quick, concise answers to all of our questions. Much better than a large group tour, highly recommended. TOUR GUIDE RESPONSE: Thanks Matt- I hope you all had a good trip back! TOUR GUIDE RESPONSE: Thanks Anna! I highly recommend Peter as a guide. He was very knowledgeable and interesting to listen to. I would definitely use him as a guide again. Thank you Peter for a wonderful tour. We learned a lot and thrilled with you and the tour!!! Peter brought the history of Boston alive. TOUR GUIDE RESPONSE: Thanks Richard! Peter was an outstanding guide. He was most knowledgeable about the historical facts of the Boston, Lexington, and Concord area. He had the perfect balance of information and wit. Each one of us in our group was thrilled with our tour. He tailored the tour exactly to our needs and wants, and he was able to cover a lot of territory in a timely fashion. I would highly recommend Peter as a guide. I and my four other friends really enjoyed our tour with Peter. He picked us up promptly on time. We were heading to Lexington and Concord to learn about Paul Revere's Ride and the history of the area. As we were passing through communities, he would tell us about the area and point out places to visit. He even drove us around Fenway Field, which was a highlight. He was very knowledgeable about the historical events and very accommodating. I would highly recommend taking a tour with Peter. Excellent tour. Lots of history and stories. Daniel has a fantastic personality and easy to hear and understand. Would recommend to anyone interested in a fun any informative tour of Boston! We had a great afternoon out with Peter. We shifted our topics slightly from just the Puritan Days and Peter was happy to accommodate. Significantly broadened our understanding about the lead up to the civil war which geared us up perfectly for watching Hamilton the next day! Salem was so pretty and the witches stuff was fascinating. Peter was a great guide. Easy to talk to, very knowledgable in the history of the area. He had a nice clean van and was always prompt. I would recommend him to anyone. TOUR GUIDE RESPONSE: Thanks! Be well. TOUR GUIDE RESPONSE: Thanks, Dennis. I hope you all enjoy your trip! TOUR GUIDE RESPONSE: Thank you Sara-- you were a fun bunch! I hope you enjoyed the rest of your cruise! Wonderful tour with Peter. He was so interesting and made the history come to life. I would highly recommend this tour with Peter. He was accommodating, interesting, and very knowledgeable. Great informative tour!!! TOUR GUIDE RESPONSE: Hi Karen- thanks for your nice review. I enjoyed meeting you both! TOUR GUIDE RESPONSE: Hi Tom- Thanks for the review-- we were blessed with a wonderful summer day to explore Boston and New England. Stay well! We took a tour of Literary sites in Concord. Peter was great - had prepared many options for us and let us choose what highest priorities were throughout the day. Very knowledgeable on all aspects of area and very enjoyable day we spent with him! Highly recommended. TOUR GUIDE RESPONSE: Thanks-- I'm sorry the weather wasn't better, and hope you all had a good time anyway! TOUR GUIDE RESPONSE: Thanks Danna! Excellent historical tour of Boston! TOUR GUIDE RESPONSE: Thanks! I hope you're enjoying your New England visit! Peter was great! This is the second tour that my family has taken with him. He knows the city very well and has a lot of knowledge about all sights in and around Boston. Lexington and Concord was a tour that both of my 9 and 11 year old sons enjoyed. Thank you Peter and maybe we will see you next year for another tour. Our family came to Boston as part of our cruise. Peter was so professional and personable, and we left Boston knowing much more about the history of the city! Not only was the vehicle comfortable, but he also managed to maneuver through some pretty heavy traffic to show us as much of the city as possible. We would definitely use him again if we visit Boston in the future! TOUR GUIDE RESPONSE: Thank you, Cindy! Peter has a wealth of knowledge and information to share with his guest. We were somewhat limited in our movement about the city due to a very large parade at the time of our tour. He managed this very well and our time was full of the sights of Boston. Highly recommend Peter as a tour guide. TOUR GUIDE RESPONSE: Thanks, Harvest! TOUR GUIDE RESPONSE: I did! Thanks, and enjoy the rest of your time in the states! Peter was very prompt to pick us up in front of our hotel. His tour was interesting and informative, with additional side stories about details of the History of people, places and events that not only shaped Boston, but our nation. I highly recommend Peter. TOUR GUIDE RESPONSE: Thanks so much for your kind words! Great day! Peter demonstrated a very good range of interesting facts related to the local history. Also, prior to our arrival Peter helped me with other questions I had concerning the local area. Would highly recommend!!! TOUR GUIDE RESPONSE: Thanks again, Dale. I hope you enjoyed the game at Fenway Park! We had booked Peter well in advance. After the cruise Peter picked us up at cruise terminal at the appointed time, returned us to our hotel on time, had a comfortable van and was an excellent driver. Peter demonstrated excellent knowledge of the local history and was very easy to understand. He took his time with us and addressed any questions we had. Would definitely recommend Peter for his tours. As a side note, both eating establishments Peter recommended were great. Peter was an exceptional tour guide for our group of six aged 24-72. He was totally flexible with our time constraints, added in everything we wished , and checked in to ensure we were seeing and experiencing what we wanted along the way. My husband's hearing difficulty was not an issue . Peter is a very clear and audible speaker with no discernible accent. Cannot say enough good about Peter's knowledge and abilities. Highest recommendation possible. Thank you for a great day! Peter was awesome. He made the tour very interesting and was very accommodating. Would definitely recommend. TOUR GUIDE RESPONSE: Thank you, Tracey! I'm glad you all enjoyed your visit. Great guide. My 12 and 8 year old kids thought that tour was amazing, and so did I. Thank you! Peter was very informative & knowledgeable about the Boston area. The three hours flew by, we enjoyed it so much. TOUR GUIDE RESPONSE: Thanks a lot Larry for the nice review! If you like history and humor, this tour is for you! We took a three-hour tour with Peter and it seemed like it went by in minutes. Peter is informative, engaging, accommodating and funny! Our family of six had a great time. What a fantastic way to get to see lots of Boston in a short amount of time. Thanks!! TOUR GUIDE RESPONSE: Thanks Dianne, for your kind words! I enjoyed meeting you all. I hope you have a wonderful Easter holiday here with your family. Go Pats! We asked Peter to create a customized 5 hour tour for our family that included Louisa May Alcott's home, Walden Pond, and Lexington/Concord. Our tour was fantastic and also included Bunker Hill, Harvard and sites along the way. Peter was knowledgeable, flexible and friendly. Our two teenage daughters were interested and engaged the whole time. An all-around great experience. Thanks, Peter! TOUR GUIDE RESPONSE: Thank you, Joseph, for your kind words. It was an enjoyable day all around. Best to you, Amy, and the kids! Peter's flexibility in scheduling, his assistance in planning, his knowledge of Boston and his presentation to the student group were all outstanding! TOUR GUIDE RESPONSE: Thanks, Jim! They were a fun group. TOUR GUIDE RESPONSE: Thanks, Alton, for the five star review! Awesome Bostonian guide. Well worth the money. We fell in love with the city, her history and her charm. Thank you, Peter. TOUR GUIDE RESPONSE: Thank you, Pamela-- I hope you and Jack had a great visit here! Peter was a wonderful guide on a very cold day for our group of six family members. We included an American history buff, a 12 year old, a grandmother, a Fl. Doctor and his wife, and a lawyer. We were all excited and entertained by Peter's depth of knowledge and well planned itinerary. We had a wonderful time with Peter. He is very knowledgeable and focuses on topics of interest to his clients. We also enjoyed his restaurant recommendation in The North End. TOUR GUIDE RESPONSE: Thanks Judy! Happy New Year! Peter is a great tour guide. Very knowledgeable on history and facts about Boston. My family and I enjoyed this tour very much. If only we had more time! We were able to customize some of the sights we wanted to see. I definitely recommend taking a tour with Peter. Peter was very obliging, informative and pleasant. We would highly recommend having Peter for any tours. TOUR GUIDE RESPONSE: Thanks Judi! TOUR GUIDE RESPONSE: Thank YOU, Dena. I enjoyed meeting them. Peter was knowledgable about Boston & it's interesting history.He was very pleasant & was flexible about the itinerary. There is so much to see and experience in Boston. We were a little overwhelmed with all the history. Peter did a great job of giving us an overview from the car. I wish we would have had time to get out and walk a little, but we would then have missed some of the sights. Wonderful overview for first-time visitors. TOUR GUIDE RESPONSE: Thanks Susan. I'd have been happy to stop if I knew you wanted to. Peter delivered as promised. This was our first trip to Boston. Peter was exceptionally informative about the history, and the sights. All in all an excellent tour. Peter was professional, upbeat and very friendly. We learned so much about Boston in our few hours with him. I will highly recommend him as your Boston tour guide! Peter was knowledgeable and shared a lot about the history of Boston. Great sense of humor, punctual and his vehicle was very clean and comfortable. All around great driving tour but would have enjoyed more frequent stops to get out and walk some of the route to take pictures. TOUR GUIDE RESPONSE: Hi Nancy- I wish I'd known you wanted more stops, we certainly could have! (Of course you would have seen less due to the time spent). Peter Brennan constructed a personalized tour for six of us and it was wonderful. Everyone had been to Boston a couple of times but Peter took us places that are up close and personal and places none of us had ever been. He is not only knowledgeable but vey innovative and humorous in his narrative. History and historical places are always dependent upon how the information is delivered and Peter is a master. I will always contact Peter for another tour when in Boston. TOUR GUIDE RESPONSE: Thanks Debbie! A great tour of Boston and the surrounding area. There is so much to see. Peter did a great job of pointing out the highlights of the area. TOUR GUIDE RESPONSE: Thanks, Robert, for your kind words! We had only one day in Boston and Peter gave us a great tour of the highlights and history of the city. Having the tour by car made all the difference because we were able to cover a large area in a short amount of time. Definitely worth the cost and we highly recommend Peter as a guide. TOUR GUIDE RESPONSE: Thanks, Kathleen. I enjoyed meeting you both! Peter is an excellent tour guide. He kept our party of 6 entertained with all his knowledge. An he was very agreeable to make stops at any location we requested. I highly recommend his tours! TOUR GUIDE RESPONSE: Thanks Lee! Peter was great to work with. He custom built the tour for our needs, and we saw exactly what we wanted. Fantastic tour guide. I would call him anytime. He picked us up from the Airport and dropped us off at our hotel. Very responsive and reasonable. TOUR GUIDE RESPONSE: Thanks, Amy- I hope you all had a wonderful cruise! Peter did a fantastic job of introducing us to the beautiful city of Boston. His overview and insiders information on so many of the city's attractions have us planning another trip to see more! Peter picked us promptly at the cruise ship dock. His Toyota van was clean and comfortable. Peter was very informative and he showed us all the sites possible in an overview of Boston and Cambridge. He made suggestions for lunch in Boston and dropped the four of us off and picked us up outside an hour or so later. All in all the four of us enjoyed the tour and would highly recommend his tour to others who have a short time to see Boston. He then dropped us at the airport for our return flights. TOUR GUIDE RESPONSE: Thanks, Linda! I enjoyed showing you all around Boston! Peter provided an excellent experience. His knowledge of the historic events, through more recent history gave us a well rounded experience of Boston. We give Peter a 10 out of 10. TOUR GUIDE RESPONSE: Thanks, Tom! Enjoy the rest of your visit to New England! Peter is a gem! His Boston and Salem knowledge is impeccable, which we really appreciated since we had questions about not only history, but lots of other topics regarding Boston. The tour covered alot of ground but was not overwhelming. My high school junior will be taking US History next term, and I truly feel that this tour was a wonderful intro to that upcoming course. I do need to note that Peter was very flexible and understanding when we requested a quick stop here & there. Great experience!!! Our family of four had a marvelous tour with Peter Brennen. 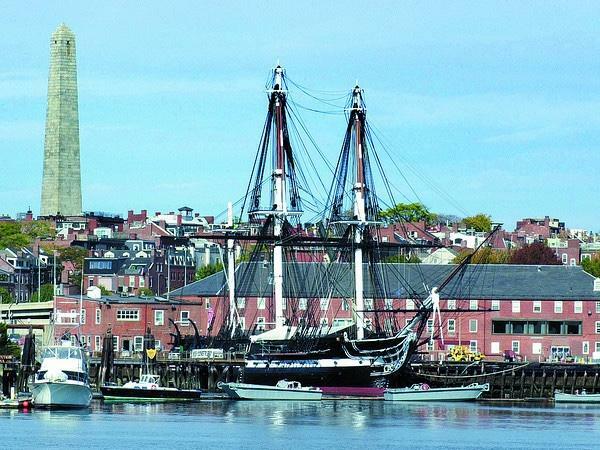 He picked us up as we disembarked our cruise ship in a very timely and efficient manner and we began a grand day of touring Boston, Wilmington and Concord. Peter did an excellent job of customizing our tour to take in places that were special given our family's revolutionary forebearers. His knowledge of revolutionary Boston and surrounds is deep. Peter tells you the history of the area in a way that is fun and unforgettable. Peter was very knowledgeable in Boston's history. We were able to exit the van at Mike's Pastry, USS Constitution and at Fenway Park for pictures. I had him drop us off at The Public Garden. I will definitely be using Peter again. TOUR GUIDE RESPONSE: Thanks Jeanette- I'm glad you enjoyed your visit here! We had a substitute guide but she was great. TOUR GUIDE RESPONSE: No you didn't -- It was me! TOUR GUIDE RESPONSE: Thanks, Robert! TOUR GUIDE RESPONSE: Thanks, Robert-- enjoy the rest of your journey! This tour was great. Peter B gave us information about our Revolutionary period we didn't even know. We definitely would recommend this tour and especially Peter. TOUR GUIDE RESPONSE: I appreciate your positive feedback! Boston is an interesting and historical city. Peter made the city more interesting. At the end of the tour with Peter, we all had a better knowledge of the history of Boston. Peter is easy going, informative, and, more importantly, concerned about the people with whom he is with. Anyone wanting to have a better understanding about the history of Boston and Lexington and Concord, would enjoy having Peter as a guide! TOUR GUIDE RESPONSE: Thanks Pat! We'll be holding those oysters and pint of rum for you and Guy at the Union Oyster House! Peter was terrific. A three hour history lesson. We've been to Boston several times on business and vacation, and this was our best trip ever. We highly recommend this tour and Peter. TOUR GUIDE RESPONSE: Thanks Bill for the kind words! I'm glad you enjoyed your visit. An injured knee kept us from walking the freedom trail but Peter's tour helped us not miss a thing!!! We covered so much territory and so much history! I lived in Boston, one of us had only visited for business, and the other a complete new comer to Beantown---We all got so much out of the tour! Great job Peter and thank you for the history lessons, local info, and dropping us off to a great lunch!!! TOUR GUIDE RESPONSE: Thanks Dena! Our tour request was of neighborhoods in our price range with public transportation needs. Our group was made up of resent empty nesters and a new couple that may be transferred to Boston. As these are both ends of the spectrum Peter accomplished our goals. His love of Boston and history left us with a warm feeling for the city, Peter is the gold standard for tour guides! We had a great morning with Peter. His vehicle was very comfortable and his knowledge was encyclopaedic. His van went everywhere we could have imagined and we learned a whole lot more about Boston. Best of all, his knowledge was accurate and delivered in a good humoured yet informative way. We would highly recommend him! Peter was a very congenial guide and gave an excellent and insightful tour of Boston. Our stop off at Fenway was perfect. Highly recommended. Peter is extremely informative and very accommodating. Our decision to take the tour was last minute, but he took his time and introduced us to a side of Boston we didn't know. Very knowledgeable and personable. Taught us so much history. He was also a very safe driver. We would never have been able to see Boston in a day without him. TOUR GUIDE RESPONSE: Thanks David, I enjoyed touring with you and George. Have a great time on the rest of your cruise! TOUR GUIDE RESPONSE: Thanks, Clyde! We enjoyed our day with Peter completely. He gave us a great overview of Boston and made the History very interesting. If you have special requests, Peter goes beyond the usual to cheerfully accommodate you. He obviously likes his Boston area and presents history in a very interesting way. Boston traffic was no problem for Peter, who is an excellent driver. Couldn't ask for a better tour.